Two days ago, on July 19, Kiko wrotte a letter to his followers to give them, in his own words, a "great new": Carmen Hernández has just died. I am not going to talk about her directly. I want to talk about Kiko's attitude through those lines. First of all, Carmen, as cofounder of the Way, was a public person. When a public person dies, there used to be a public press release. Kiko wrote his letter to be sent to all media, not only as a "private" letter to be read just by neocatechumenals. Let me tell a little about Spanish customs around death. Good manners for us are to express our condolences to the family of the dead person with silence and a kiss or a hug, but always with sobriety. We think words are better to be said in life -we do not give speeches or express emotions far from the only words of condolence. That is our cultural protocol of mouring. Sobriety, contenance. Not adding more pain for family with too much emotional expressions. We value silence very much. The normal is to go to a tanatory to offer the condolence for the family, then there use to be a mass for closest persons or for public, it depends on the family desires, then the deceased is buried and after all, a few days later, there use to be a funeral mass. Spain is not different in this. We are not "strange" people. All that protocolo does not fit at all with Neocatechumenal Way's customs. When somebody from the Way dies, it is like a party. No tears, no silence, not contaitment. They sing, laugh and dance, even with clapping hands. No sadness. Just joy and happiness. When somebody dies it means "lost". Even when you are a deep catholic, you do not use to live your lost as a gain. You, catholic, wait for God's judge on Love. You, catholic, belive in Final Judge and in Resurrection when God comes. You, catholic, are human. And humans suffer with a lost. Even JesusChrist cried with his friend Lazaro's death. 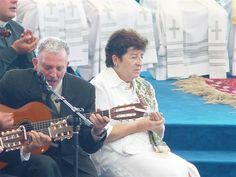 But you, neocatechumenal, are expected to sing loudly and feast when a loved one dies, more if that person was also a neo-member. The more happy you look, greatest your faith. And they expect the same from any catholic as truly belivers. And if you do not share their view, you are acused of not having enough faith. If you cry, for them, you are not convinced of deceased person is on Heaven with God. They automaticaly say "he/she has passed with Father", "he/she is singing happyly now on Heaven", "he/she is celebrating an eucharist with JesusChrist on Heaven", "he/she is dressed on white linon tunic on Heaven with all saints", etc. I remember a very famous woman of the Way in Spain, she was a daughter of one of the very first beginers whith Kiko here. She and her husband were one of the first neo families sent on mission, just when he was diagnosed by a cancer. He died very young. They celebrated an eucharist "corpore insepulto" in their parrish in Madrid and we all were impresed by her, she did the "ambiental monition", she sang as a psalmist, she danced and she was encouraging everyone. It was one of the greatest neo propaganda events I have ever lived within the Way. She was showed by all catechists as the perfect christian in neocatechumenal terms. They used her case to harm other women and men who becomed widows and maybe cried or felt sadness. Of course, in the Way you will never know the real life of persons who are showed as the best of a classroom. Your catechists will never tell you the truth. And I know that "super woman" had some grave depressions after her husband's dead. She and their children suffered a lot, as many others. But it was always hidden, wraped up in lazes and nice colours. I knew it because I was a very good friend of one of her brothers. I saw it with my own eyes, despite all propaganda methods used by upper catechists and even Kiko when they talked about her in their catechesis. Kiko and his enchanting words, able to stay talking about himself over all even in Carmen's dead communicate. I have been reading all comments on digital Spanish newspapers about this new and Kiko is seen as a selfish, an egocentric, because of giving him importance in these circumstances. The most of people also remark the ugly manner he used to "sugest" Monsignor Rouco to preside Carmen's funeral, instead of actual Archibishop of Madrid, Mons. Osoro (who stopped the Way's leadership with Family Day's in Madrid). 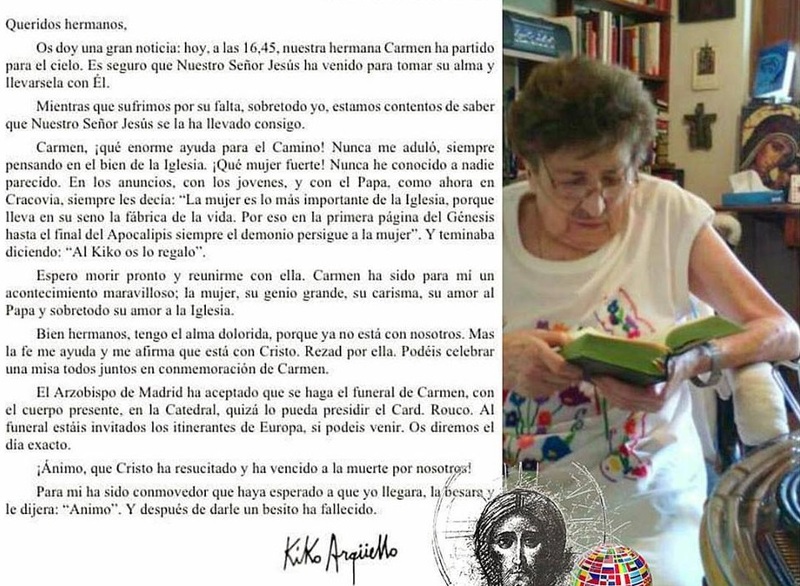 "El arzobispo de Madrid ha aceptado que se haga el funeral de Carmen, con el cuerpo presente, en la catedral, quizá lo pueda presidir el Card. Rouco". (Translation: Archibishop of Madrid, has accepted Carmen's funeral will be celebrated, corpore in sepulto, in cathedral, maybe Mons. Rouco could preside it"). How ugly has been that gesture that some newspapers have decided to suppress it, like an autocensure! Mons. Rouco was the one who gave wings for the Way in Spain and in Vatican, of course. Mons. Osoro is much wiser and it seems Kiko does not like him very much. What a bad style! And a great mayority of commenters, catholics non neocatechumenals, do not agree with the idea that Carmen is right now in Heaven as Kiko says freely. They do believe she has to be judged as each of us. 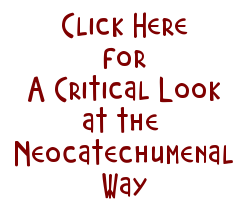 But neocatechumenals do belive they go straight from the Way to Heaven. People remain even when JPII had died, any cardinal or bishop said "I have a great new for you". It is not a matter of faith. People do not like neo-theatre anyway. People do not understand as a lack of true faith to choose silence and emotional containment instead of party and clapping around the death. But the fact is that neos always have to give the discordant note. That is normal ordinary standard people's view. Adidas ruega una oración por su alma y decreta tres días de luto oficial. Adidas pray a prayer for his soul and decreed three days of official mourning. At least, for many people, truly sinners, Carmen Herández always will be our dear "Carmen Adidas". One last personal question: why has been Kiko keeping silence about Carmen's illness and telling several excuses about her (while people could noticed she was in a bad state since some years ago), as it was said in another press note sent by the Neos' voicer after she died: "her health had worsened considerably last year and a half, without any specific disease diagnosed"? Why being so secretive with her while one of the main characteristics of the Way is having to tell publicly each little thing of everyone's private life? Why Kiko, Carmen and Mario's lifes are hidden for their followers? If they want to preserve their private life apart from the others, offering a different image than the reality, why Kiko gives a picture of Carmen like in pijama with oxigen glasses in her nose and extremely thick while praying? Why does Kiko said that Carmen was not diagnosed by any specific disease, when the most of people were saying she was with a Parkinson's disease since some years ago? Finally, why Carmen died in Madrid while Kiko was living in Rome? Why they used to live toghether as a couple not married in Rome but she went to Madrid to die far from him? She was close to death since some days ago, when rumours everywhere increased a lot. Misteries unsolved. They, leaders, are a case apart within their own movement. Quite strange. The end. 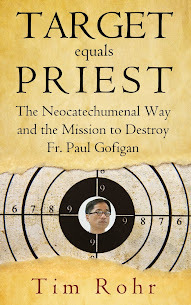 Here a video I have just found in youtube about the funeral and burial of a Neocatechumenal priest, catechist. Maybe in Mexico, I am not sure. They sing a Kiko song "get me to heaven, because to die is, with much difference, the best" (I do not know the equivalent in English, sorry). You can hear the clapping hands while singing whitin the temple in first video. After watching that, I was remembering my mother in law, who never entered the Way. 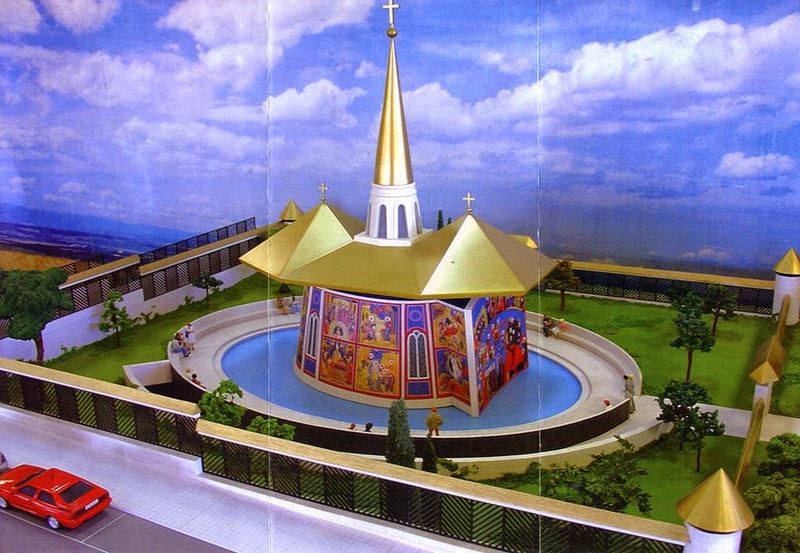 Once she assisted to a neocatechumenal's burial or funeral and, after it, she asked us: "please, if you love me cry a little for me", as she got scandalized with no crying but dancing neocatechumenal people. Now I understand why she told us that. Hola Lapaz. The funeral in the video you posted IS from Alberto Zamora, here in Mexico. Actually, there's my ex-father in law carrying the coffin with other men. Alberto Zamora was a mexican priest, he was my cathechist for some time, and he was one of kk's 72 major league brain suckers. Your post is dead on, as usual. i did find it strange that kiko effectively "drafted" retired cardinal rouco to say the funeral Mass at the almudena cathedral, rather than the current archbishop of madrid, osoro. with the background la paz provided, i now understand. grief is a natural response to death. to celebrate without acknowledging that grief is to deny our humanity. as la paz pointed out, Christ himself wept at the death of lazarus. death is real. death is sad. Christ's resurrection didn't eliminate death, but it gives us hope. grief and despair are not the same. that's what the neocats aren't getting here. si pudiera salir la traduccion en español , por favor..gracias..!!!!! When my son Davis died, 19 years old - I had already left two years before the NCW - I got a last phone call from Carmen: No condoleances, but: "Do you anderstood now? Go back to the NCW!" . I answered here: "You are so brave in Judaism, do you dont know, that when somebody of your close family dies, you visit them, sit on the floor and remain silent ?" and I hanged up the phone. Daniel, was Carmen implying that you suffered the tragic loss of your son Davis because you left the NCW? Unfortunately, everyone who leaves the clutches of the NCW are threatened with the same. It's also a planted suggestion. Evil is what evil does. What an outright manipulative thing to say to you during your time of grief!! Her true heart revealed itself with those comments. Wake up, Neo's!! 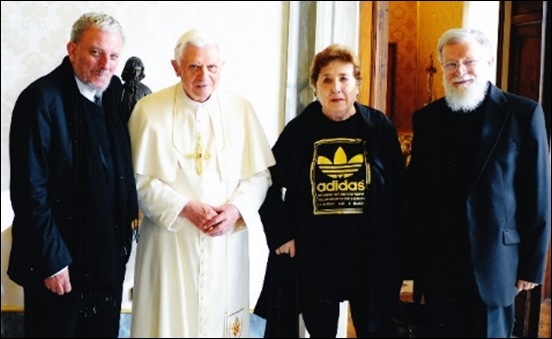 "Look La Paz, you talk about respect, but deride with the criticism of [Carmen's] adidas you are a spawn of the devil." Oh, how brave, Anonymous @8:47 PM, you are the true fruit of the Neocatechumenal Way. Para mí ha sido un espectáculo lamentable. Se critica las lágrimas, pero el dice: "Carmen está con el Señor, toda feliz, y yo estoy aquí hecho polvo". No he visto nunca a nadie decir eso. He visto el sufrimiento en silencio, acompañado de lágrimas silenciosas por la partida del ser querido. No hacía falta nada más. "y yo estoy aquí hecho polvo", lo escuche, pero no lo vi. El sufrimiento se ve, insisto, no se dice. Yes, Meripe, Kiko is a narcissist. Everything is about him , even the death of this woman. He couldn't bear that she might steal attention from him. I feel sorry for all of you that have so much time to focus on the things you need to get rid of your hidden frustration? Why not leave everybody live their feelings their own way and making their own mistakes? Are these details so really relevant? Don't you have mercy on others? It's a real shame that so many people online can get to your "sarcastic" comments and have a biased view of the whole thing.